Unexpected catastrophic flooding in Louisiana left homes and businesses in several parishes severely damaged. DKI Member, Complete DKI, helped one of the parishes that sustained damage to its schools, office facilities, libraries and its church. 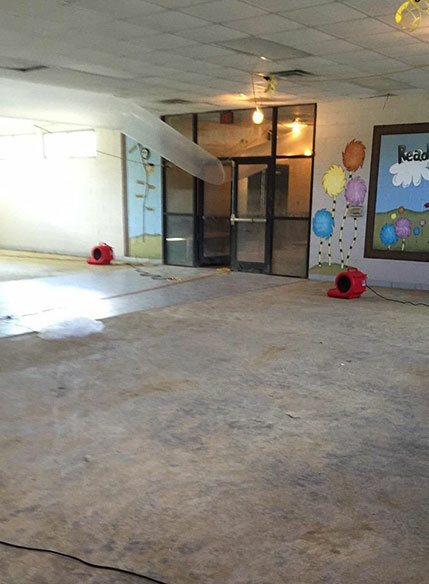 The team worked with the school district to restore their properties, including four of its schools, with up to six feet of silty mud, and a church building owned by the school district. 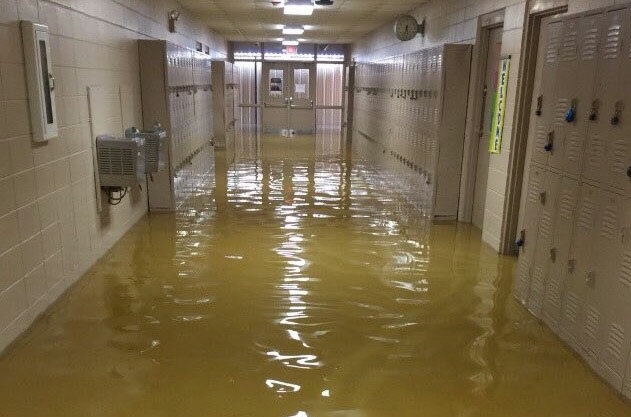 With the flooding taking place mid August, school had just started, so the classrooms, lockers and lunch pantries were fully stocked. Originally being told another company would handle inventorying and evaluating all contents, Complete DKI ended up adjusting their scope of work to facilitate these needs too. The team had to remove, clean and disinfect everything including, not only the structure, but also the contents. Once all contents were removed from all five buildings, the team used 38 semi-trailer mounted desiccants for over 210,000 cfm of desiccant air, more than 1,000 air movers, and numerous LGR dehumidifiers and air scrubbers to successfully remove the moisture in the air and dry out the structures. Generators and power distribution were used to power all of this equipment, which required fuel deliveries once to twice a day. In order to allow the school district to reopen, Complete DKI was given a tight timeline for three of the schools. The goal was the have the entire school district reopened in under four weeks. This included all the required remediation work, repairs, delivery of the contents, and time for the teachers to set up the classrooms. One example of the tight timeframe was when Complete DKI’s team had 36 hours following the clearance testing to complete the installation of the fire-rated drywall and insulation, to allow for the teachers to prepare the rooms for class that following Monday. To reduce cost, the school board managed debris disposal and all industrial hygienist testing. This added an additional layer of communication that was needed to ensure everything stayed on track. The damage to these facilities not only affected the school district and the teachers, but the entire community. Through their solid teamwork and communication, Complete DKI hit their target date to reopen the district.